3. Yesterevening the meeting of CAPSI Bihar Governing Council held at the residence of IISM Chairman Sri R.K.Sinha. The meeting was followed with delicious cuisine dinner with his love and affection to all of us. We saw his strong commitment to security fraternity. He stated that he laboured hard to bring down GST for security equipments from 28% to 18%. He also assured us that he has endeavoured rather sure to bring down GST for guarding services from 18% to 5%. On our convention he opined to organize this time at SKM or newly built Convention hall with greater impact and incorporating this time bigger family. Date we closed in 29 /30th July, 19/20th August. Now the expenses part he braved away that he will meet whatever left by us. But we told him please express your stake rest the association will manage. But his this statement emboldened our zest. 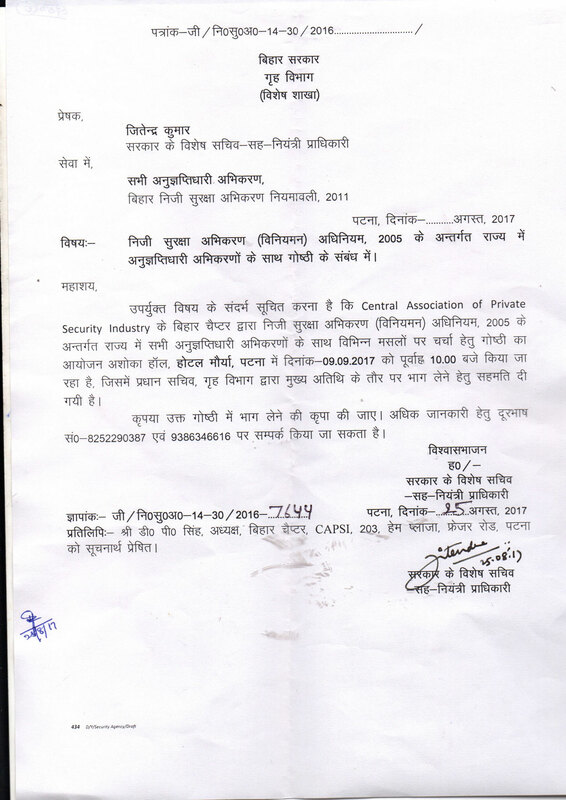 As it is already decided to invite CM and Home Deptt, Labour Deptt to our convention with presence of security luminaries in presence of national Association Captains.If anything left in minutes our fellow members may add. 5. On 12th June at 7pm all governing council members are requested to assemble at IISM Chairman Sri R.K. Sinha residence, Patliputra Industrial Area, besides P&M Mall for the meeting and finalization of Agenda and other preparedness. We will be benefited by his views, guidance and support. 6. Today on 06/06/2017 the meeting of Governing council CAPSI Bihar held at Chairman's office. Following members have participated 1) D.P.Singh. Chairman 2) Sanjay kumar Vice Chairman 3)B.D. Singh Vice Chairman 4) Ravi Shekhar Singh General Secretary 5) Sunaya Saurabh Secretary 6) Rajesh kanth Joint Secretary 7) B.K.Singh Dy Secretary Two members namely Mr.Narendra Kumar First Vice Chairman & Mr. Ajit Singh Treasurer Have telephonically given their consent to go by the decisions of the Council meeting today. Decisions The Seminar shall be held jointly with IISM Chairman IISM already confirmed. Tentative date 22 July & 29th July Venue Hotel Maurya/ Chanakya/ Patliputra Ashok in priority order Theme of Seminar Challenges In Security Management Topics of Technical Session PSARA it's compliance and anomalies Training, standards and certification Service Charge fixation IISM presentation for 30mnts Interactive session The seminar shall start with Bihar Gaan Followed by Inaugural Function with Chief Minister Bihar as Chief guest Inaugural function shall be for 90 mnts. Delegate fee shall be Rs 1000/ per delegate. A Surakshit Bihar bulletin shall be released by Chief guest. The meeting was attended by Sri R.K.Singh, Shiva Security as proposed Council member. Wing Commander Mr. Shrikant Mishra' s contribution still awaited. 7. CAPSI Bihar is going to organize 2nd annual Seminar with IISM in the month of July. The proposed topic of discussion shall be PSARA, Training of guards and the most burning topic Services Fee. This time we are planning to invite Our Chief Minister in addition to Home Secretary, Controlling Authority and Labour Secretary. For the finalization of date , venue , topic and other allied activities, we are going to meet on 6th of June at President's office at 5 pm. All honorable governing council members are requested to block their diary for the meeting on 6th of June because every thing will be finalized with them only. 8. First Private Security Conference with Deptt. of Home, Govt. Of Bihar on 7th May 2016 at Nalanda Hall, Maurya Hotel Patna.